The big bargain mid-sided all-utility moderate duty ATV is KYMCO’s MXU 500i, with all the practical features at tactical pricing. The basic MXU 500i enjoyed a complete makeover for 2016 with upgrades in both form and function. 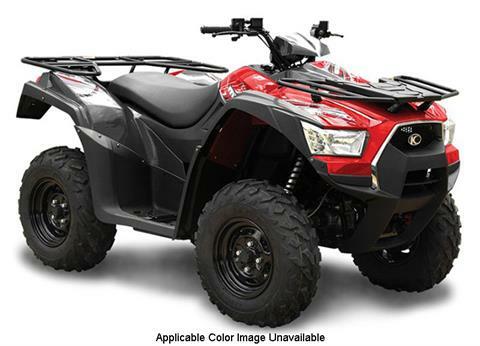 Powered by a fuel-injected 499cc, liquid-cooled, DOHC engine developing 36 horsepower, it features a more durable chassis and re-designed running gear components that make it tough enough for utility purposes and maneuverable enough to handle any recreational challenge. Dual A-arm suspension, on-demand 2/WD and 4/WD, hydraulic disc brakes and KYMCO’s CVT automatic transmission complete the redesign which also includes a 187-pound rack, 1050 pound towing capacity, a standard 2-inch receiver hitch and storage under the front and rear fenders.